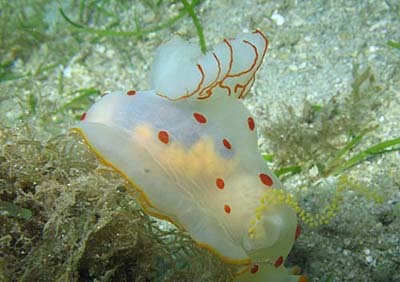 Translucent white body with small bright orange-red spots. 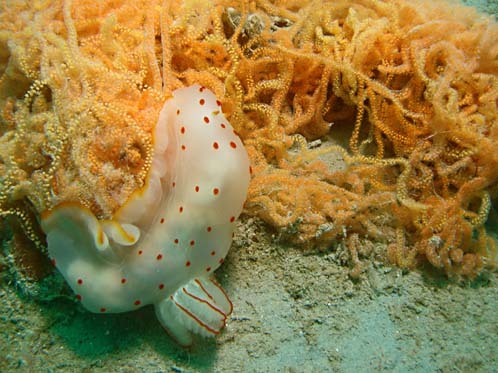 The small rhinophores have pale orange tips. size 80-90 mm, 15 November 2005. The body which is very soft, lacks a notal brim separating the mantle from the sides of the foot. The foot is larger than the mantle. G ceylonica is commonly found in shallow grass beds and sandy habitats. It is nocturnal. The yellow-orange eggs are arranged in clusters of 20-40 as described by Johnson & Boucher (1983), in loosely spiralled masses. The genital aperture is situated on the right side half way between the rhinophore and the gills. Species of Gymnodoris are voracious predators of other opistobranches, G.ceylonica commonly feeds upon the sea hare Stylocheilus striatus. Kelaart, E.F. (1858). 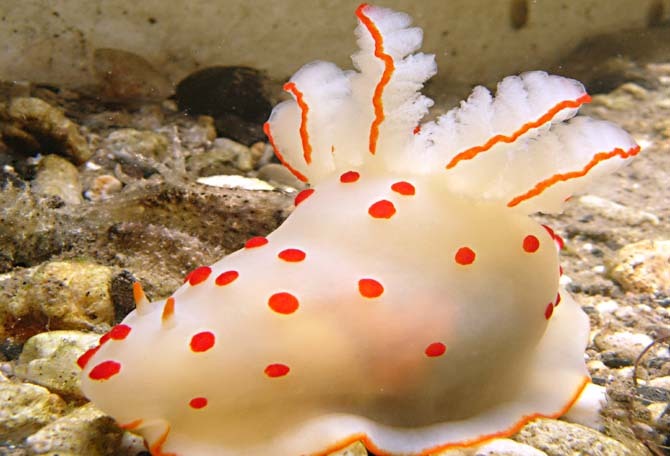 Description of a new Ceylonese nudibranch. Annals & Magazine of Natural History, (Ser.3), 1(4) : 257-258, Pl. 10B. Yonow N. (2011) Results of the Rumphius Biohistorical Expedition to Ambon (1990). Part 15. 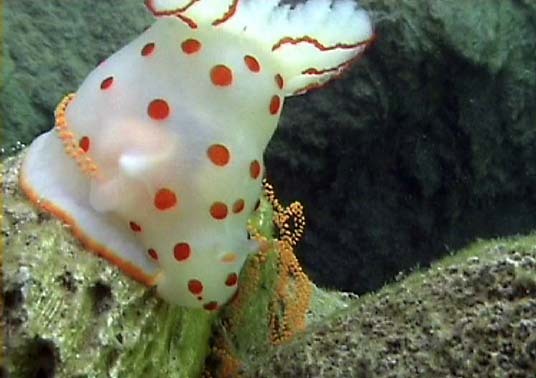 The suborder Doridina (Mollusca, Gastropoda, Opisthobranchia, Nudibranchia). Zoologische Mededelingen 85(17): 905-956. 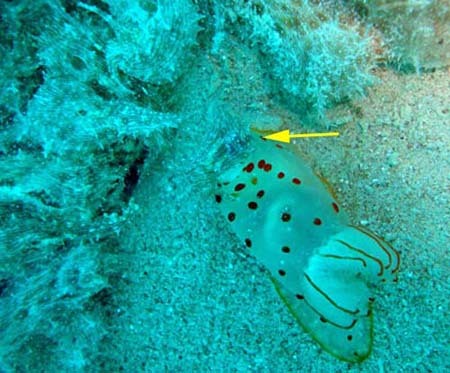 You can see the genital aperture, situated on the right side half way between the rhinophore and the gills. Saint Leu, size 80-90 mm, 15 November 2005. 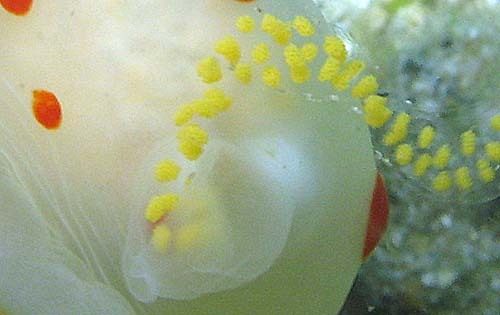 The yellow-orange eggs are arranged in clusters, in loosely spiralled masses. 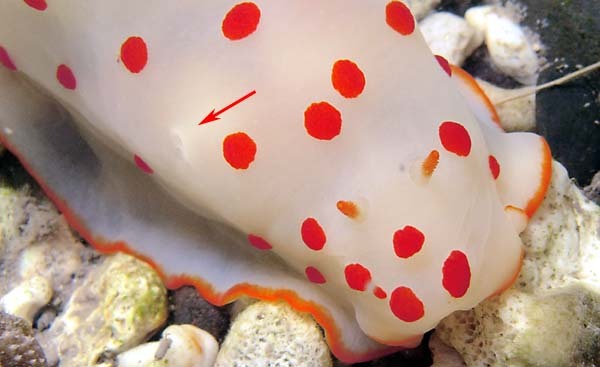 The orange spots are small and numerous, compared to the three other specimens found during this period. 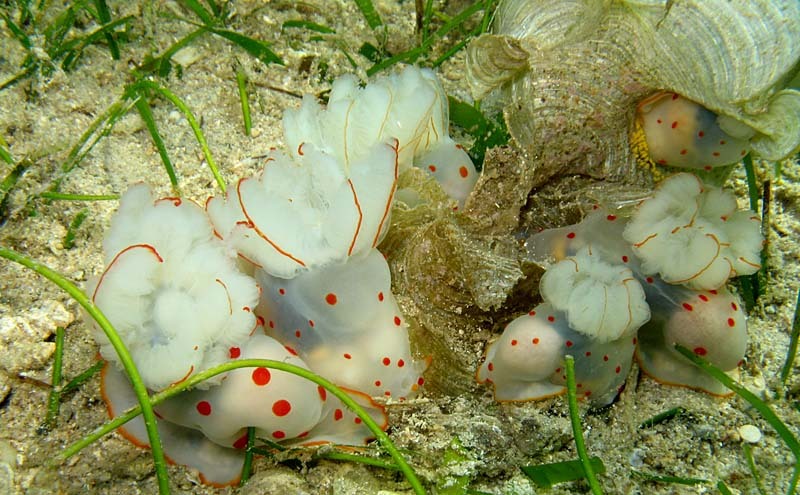 A very large number of G ceylonica was observed on the reef flat zone during this period, with numerous spawns. 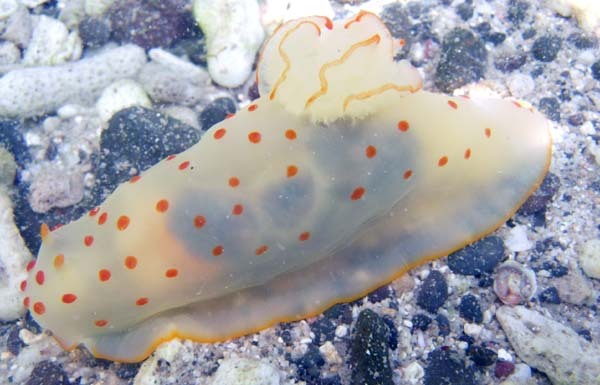 A large number of G. ceylonica was observed during one week ( 3 to 10 October). After this week the population decreased. During the last dive ( 17 October )we observed only a few specimens and some dead animals. 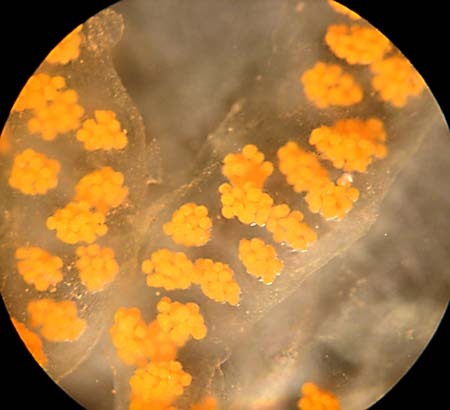 This species spawns...The yellow-orange eggs are arranged in clusters, in loosely spiralled masses. 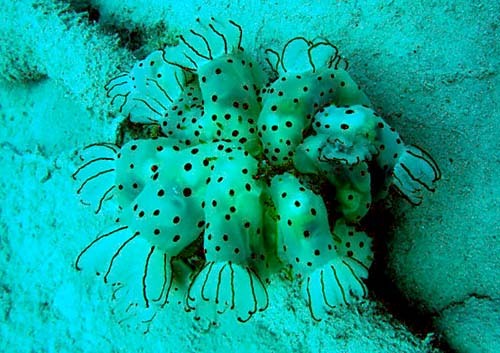 Mauritius, Gymnodoris ceylonica, at Récif des murènes, by Mathieu Bayon. Reunion, Gymnodoris ceylonica on seagrass, at Saint Gilles, "Parc Marin"